Location is great! 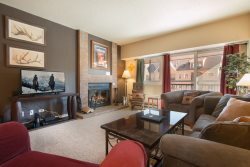 Comfy condo, great for relaxing after hitting the slopes. Perfect for a family of three, conveniently located next to the ski lift and main Street. It was great! The location at the Village was perfect for jumping right out onto the mountain and enjoying the snow. The condo was clean and enjoyed by all who stayed. Look forward to booking with Ski Colorado for a future trip to Breck. Very good value for money, as it is a spacious condo that can accommodate 2 families easily. Has all needed amenities, and a fully-equipped kitchen. Very close to the town center, skiing resorts, and the main bus station. Wonderful place to stay. The home was plenty big for the 7 of us. We stayed there because it was close to Keystone. The short drive and Hot Tub were the main reason we chose this property. The home is lovely and they have a humidifier for every room. The bathrooms are beautiful and with 4 1/2 baths there was room for everyone to get ready. We stayed here for a long weekend to ski for my husbands birthday. We had a great time. The place had everything we needed and more. We really enjoyed the hot tub and fire place. It's the perfect place to relax and enjoy the mountains. House is big (4 bedrooms) with 3 full baths, outdoor hot tub and indoor sauna. It was perfect for our group of 8 adults. The company is very easy to work with (can text or call). The motor on the garage got jammed during our weekend and the company came over within a half hour and fixed it for us. Would definitely recommend this house. Exactly what we wanted. Super close to the peak nine beaver run lift easy walk. Easy walk to Main Street for food and drink. Great hot tubs! Fantastic ski in/Ski out location right on Peak 9! Quicksilver superchair is maybe 100ft from the front door. Would recommend this condo to anyone. Great location in town as well, with access to food and shopping all within a couple of blocks. Many stores and restaurants on the same road as the condo, less than 5 min walk. Hands down my favorite condo location in Breck I have stayed in thus far. Great place to stay. The unit was clean, spacious, and had everything we needed for our recent ski trip. The location is central to all the slopes and the free shuttle stops 50 yards from the house. The house was well heated and the hot tub worked great. Each bedroom has its own bathroom, TV, and thermostat. Great location and plenty of space. The place was great. Plenty of room and privacy from one room to the next. Really nice to have the firewood available as we had some cold weather. The beds were very comfortable and it was nice to have the humidifiers in the bedrooms. My only suggestion would be to add a large skillet and some Tupperware dishes for leftovers. We would love to come back. Thanks! Great location and great stay! Location, Location, Location. Located at the base of peak 9! Walk out the door and you are in town. You can see ski school from your room. Wish the king size bad had sheets that fit, other than that, a perfect studio condo for a perfect trip. Very nice unit, clean with good beds and plenty of blankets and pillows. Great kitchen with everything we needed. The location is the bomb... you really can't be closer to the Quicksilver Lift and everything is short walk or free shuttle. Highly recommend! My group of friends just got back from an amazing week in Breckenridge! The house was exactly as described and more. The kitchen had everything we needed to make great meals and the grill was awesome! The house also offered a sauna which had not been on the listing and was a wonderful surprise to the group. Finally, the house is so close to downtown but has the privacy of not being on the main road. The ski trial leading to the mountain and shuttle to the base were a nice touch as well. We would recommend this house to anyone traveling to Colorado! Comfortable in Colorado. Nicely appointed home. Suited our family of 5 perfectly. The open view out the living room and bedrooms is lovely (even had a moose walk by!) but the deck with hot tub looks directly at a condo complex. As with any mountain property there are stairs but be aware that this is a 5 level home (including garage) with half flights of stairs. Loved the 8 ft. garage door so we did not have to remove our car topper! And the garage is heated! Super convenient to bus stop to Peak 7& 8, and next door to Nordic Center. Perfect location. Close To the gondola to get to the slopes and easy walking distance to town. Nice property and great location.